In overcrowded, highdensity Hong Kong, space to rest, relax, enjoy life and breathe can appear to be as elusive as a dream. But 8 Deep Water Bay Drive, a luxury residential project by Nan Fung Group and Vervain Resources that is located in one of the city’s most prestigious neighbourhoods, is set to change that. Featuring 52 spacious and tranquil homes, this rare site, cradled by the natural beauty of southern Hong Kong Island, commands a high level of privacy and offers picturesque views—and it's no surprise that two co-founders of Alibaba Group have reportedly invested in the property with a HK$560 million in 2018. 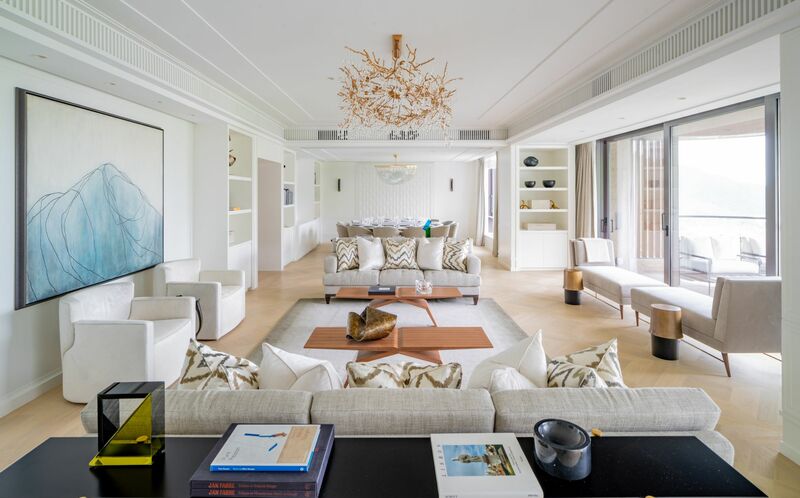 The property’s interior designer, Alexandra Champalimaud—whose clients range from Raffles Singapore to niche residential developments in New York—understands perfectly the need for serenity. “I think anyone who lives in a big dense city is looking for a sense of peace, especially within a certain proximity of their home, if not in their home. When your residence is in the middle of a city it’s so important to try and make your home your personal respite." Indeed, the genius is in the overall design: more than 80 per cent of the development is devoted to green space. “Because the natural landscape is so beautiful, it was important for the developer and architect to build units that feel like they are floating in the middle of it,” says Champalimaud. In particular, the show flat has a saleable area of 4,214sqft and four bedrooms with en-suite bathrooms, making it an ideal home for families. While the spaces, with floor-to-ceiling windows, have clearly been designed to be open, light and airy, privacy is also paramount, a focus highlighted through features such as a beautiful private elevator lobby for each of the units. But privacy is only one component. “When we designed the show flat, we were very deliberate in our choice of finishes and materials in the hope that we would create a space that would encourage families to treat their home as an urban retreat,” Champalimaud says. The masterpiece in the show flat is The Great Room, a multi-functional formal space designed for home entertaining that features breathtaking views from full-height windows, and an airy terrace for cosying up to nature. Champalimaud says the “House Living in the Sky” concept speaks to the spaciousness of the units within the tower and to its hillside location. “We wanted to maximise the light, airy feeling of living at that elevation, so we created a material and colour palette that responded to that. Inside you’ll find that light oaks, soft whites, and smoky veined marble are paired with understated custom millwork and finishes giving you a sense of lightness.